Thank you Sam and Emily for making my first Mother’s Day perfect. It was just lovely and perfect. To be honest Sam, you’re not a card buyer, that’s probably a bloke thing, so I wasn’t expecting much. I thought you’d skip on the card front and just stick to a bunch of flowers but you did good. 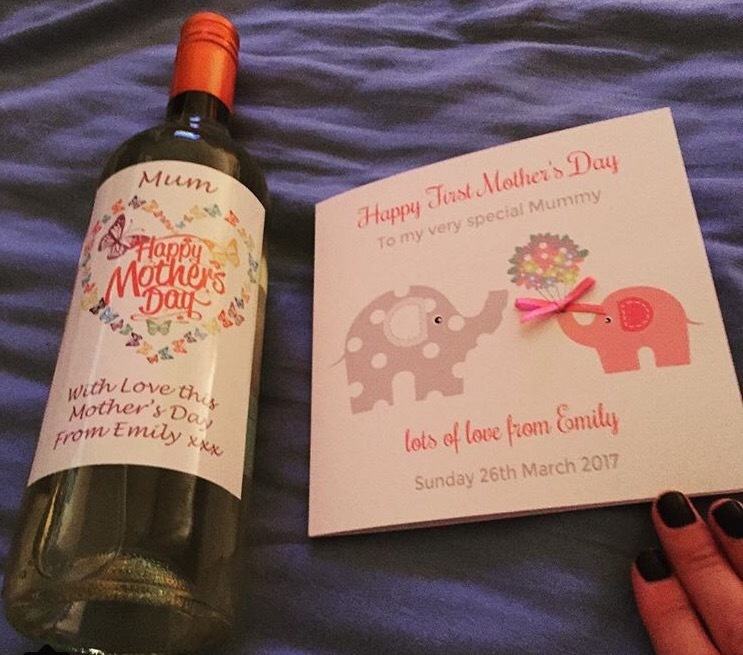 It was so lovely to receive a personalised card, a personalised bottle of wine, a bouquet of flowers and my favourite trainers (Converse, what else? ), it did surprise me and it was perfect. The day was lovely too. You made a lovely breakfast, I made a great lunch and even though I made a scrumptious chocolate brownie cake for after, we were too pooped to eat it. But I wouldn’t have changed today for the world. Just us three, my perfect little family. And now, whilst Emily is tucked up dreaming peacefully in her cot next to us, I’m thankful I have you both in my life. I wouldn’t change this for the world. I love each day we have with each other and Emily is growing so much it’s crazy to think she’ll be 4 months in under a week.